I can’t really even tell what’s going on with this set-up…. I don’t know what to say really, haha. Guess it’s not really an “indepth look”. The pictures kinda speak for themselves. Makes you a big worried about what the world is coming to when people attempt these things and actually think that they will work. Writing this up actually reminds me of a time when I used to see people selling turbo kits on Ebay made out of PVC piping. I actually think I saw a pvc turbo kit in person when I went to a local car meet way back during the street racing days. I kinda wonder what people are thinking when they are taking pictures of this kind of stuff. Are they really proud of the work and now that these pics have made the rounds all over the net, where are they now… Hopefully they’ve faced glorious amounts of ridicule and shame…. Never seen this kind of work before. Thanks for sharing this. Turbo guys must be embarrassed all over the world. Some of those pics do remind me of level 3-4 herpes outbreaks. wow. whole new meaning to ghetto. there are plenty of these pictures you could’ve posted twice and I would’ve been like “yeah that deserves a second look.” This one however isn’t as bad as welded downpipe back into the manifold however lol. oh, and this should help blow your mind as well. Bookshelf on the trunk looks pretty legit to me…. LMAO I have nothing to say but good write up……..
Natural selection at work is all. Their “engineering” ideas will become mis-haps which weed them out of the gene pool. 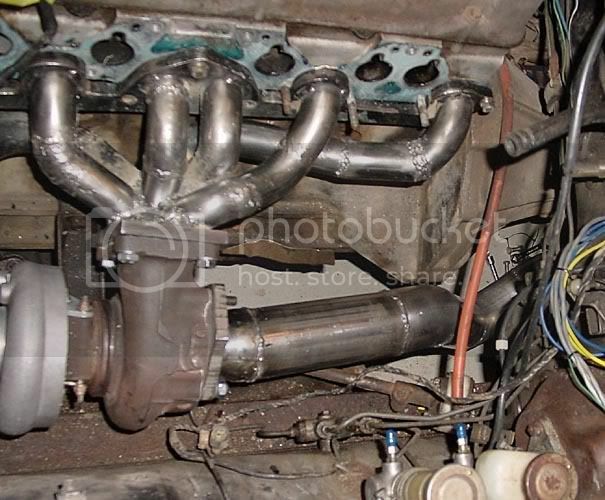 Jesus those turbo manifolds look like they have elephantitus! sadly. youde be surprised what actually works when you have real low funds and a cheap welder and some old pipe is cheaper then a new part. but seriously take another look at some of those pics. one was an ok diy job and would work. but at a quick glance you dont realize the intake and exhaust are both on the same side of the head. once you realize that it looks fine. for a DIY job.